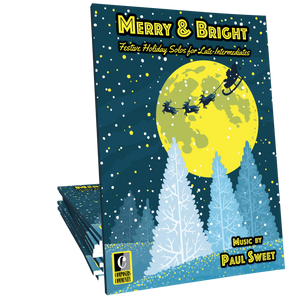 Jam out to this pulsing, pop-inspired arrangement of O Come, All Ye Faithful by Paul Sweet. Driving rhythms, wild syncopations, and showy passagework will make this a perennial favorite! Well, I would like to say I got this for students but...I got it for myself. A really different arrangement than I had played before, tons of fun. Highly recommended. ...and just when I thought that I had "played it all", and there was nothing exciting and fresh and fun and DELICIOUS to play, along comes Paul Sweet. I am greedily saving this piece for myself - I have my student's recital coming up, and this may be what I play at the end. I also think it would take their breath away at church at Christmas. Oh my goodness.